We have had such lovely weather so far this week - spring has well and truly sprung. Elijah and I have been enjoying going for a walk together during the day and spending some time in the garden in the afternoon while we wait for Joel to come home. We used to just look out the window for him but it's so much nicer to wait outside and Elijah loves having a wander around. The other day I thought I would snap a few quick photos of Elijah and share his cute little outfit. 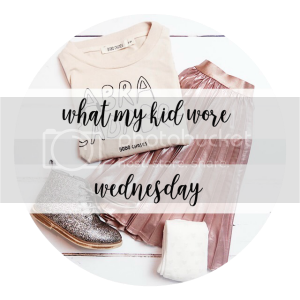 I also thought I would link up with a new kids fashion linky What My Kid Wore Wednesday hosted by Sarah at This Mama Life and Hannah at Just Hannah Jane. I love overalls on little people. They are so cute and it's so easy to put together a nice, casual outfit without too much effort. These ones are extra cute with Mickey Mouse on them - I love everything Disney. I love dressing Elijah in grey tops, I think they really bring out his gorgeous blue eyes. And we have two pairs of these little blue shoes that we bought when we were in Australia last year. They are perfect for him to wear while wandering around the house.